"An introduction to the mandala and practical information on how to use one." Mandalas are symbols of wholeness that reflect the symmetry of natural forms, the cycle of time and the circle of community. They can be found in cultures around the world and throughout history. This comprehensive book introduces the reader to the many different forms a mandala can take, from ancient Hindu mandalas to the intricate patterns of Native American sand paintings and Celtic knotwork. It also provides practical information on how to use a mandala to promote spiritual health and well-being. The Mandala Bible is organized in three sections: the first describes the mandala in spiritual traditions, the second section explains how to work with mandalas, and the last section is a workbook with over 80 beautiful mandala illustrations for coloring and meditation. 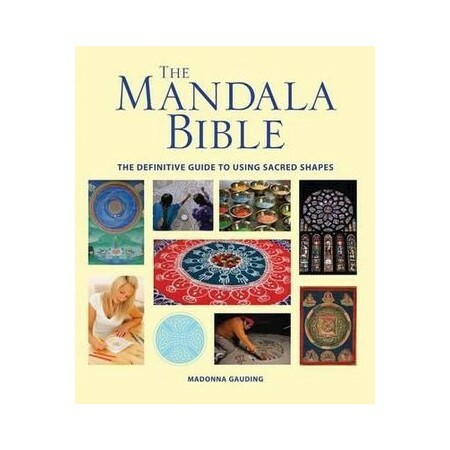 The Mandala Bible describes: Hindu mandalas, Buddhist mandalas, Christian mandalas, Celtic mandalas, Native American sand painting mandalas, Meditations and visualizations, How to create a sand mandala, Mandalas and color healing, Mandalas and spiritual healing and Mandalas and creativity. Mandalas can be seen in the labyrinths of medieval churches, as ancient decoration and in jewelry. Swiss psychologist Carl Jung used mandalas as an aid to psychological understanding while for centuries Buddhist monks have painted intricate mandalas only to sweep them into the sea - the circle of life. The Mandala Bible is an enlightening introduction to this universal symbol.